In August 1941, the netlayer HMS Guardian landed Royal Navy construction crews on Addu Atoll in the Maldives Islands to begin work on a secret naval base for Britain’s Eastern Fleet. Though in public British leaders continued to point to Singapore as the lynchpin of the Far Eastern defenses, already they had grown concerned that the “Malay Barrier” of Malaya, Sumatra and Java could not be held in the event of a Japanese attack. The British Eastern Fleet had left most of its base facilities in Singapore, including drydocks and repair sheds. In the event of Singapore’s loss, it was to fall back on Trincomalee on Ceylon’s eastern coast. But Admiral James Somerville, the fleet commander, found the port inadequate and doubted that it could be defended from determined attack. He wanted an alternative base somewhere in the middle of the Indian Ocean, which became known as “Port T.” Not openly stated, but understood, was that such a secret island base would also be secure from the prying eyes of Indian nationalists, all of whom were suspected of being in league with the Japanese during the paranoid days of late 1941. 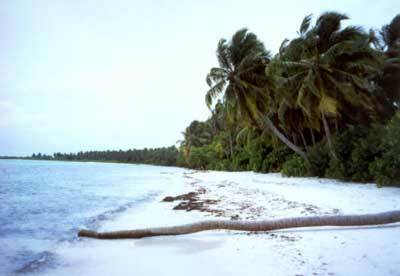 Addu Atoll. Central Intelligence Agency map. Addu Atoll, also known as Seenu, is the southernmost island group in the Maldives. It consists of several large islands ringing a deep lagoon. There are several channels leading into the lagoon, with the best of these at the southern end of the atoll. The Royal Navy selected the southernmost island, Gan (pronounced “Yahn”) for their airbase and began construction of three crushed-coral airstrips for the Fleet Air Arm. This was turned over to the Royal Air Force in 1957 and became “RAF Gan,” a base that would be used intermittently until 1971. The FAA base on Gan in theory could handle all aircraft in the British inventory, but had short runways and larger bombers often crashed on landing. While troops hacked down the jungle on Gan and prepared the airstrips, Catalina and Sunderland flying boats began operating from the jetties on the north shore of Gan. The base’s most important facilities were the big oil tanks built on Gan and on Hitaddu Island on the western edge of the atoll. These would by necessity be visible from far out at sea, but the islands’ low elevation made this inevitable no matter where they were placed. The 1st Royal Marine Coast Defense Regiment provided the garrison troops, manning shore batteries and anti-aircraft guns on all six of the atoll’s major islands. To facilitate the defense, the important islands on the western edge of the atoll would be linked by a light railway across causeways built up between the the islands. This was not operational until much later in the war. Except for the Gan Channel, the other openings were permanently closed by anti-submarine nets. A pair of Australian refrigerator ships were requisitioned in Syndey, loaded with canned foods, several tons of American-made cigarettes and 5,200 gallons of rum, and stationed in the lagoon to re-supply British warships. These had Chinese crews and Australian civilian officers, and most of the work was handled by Maldivians hired from the local population. 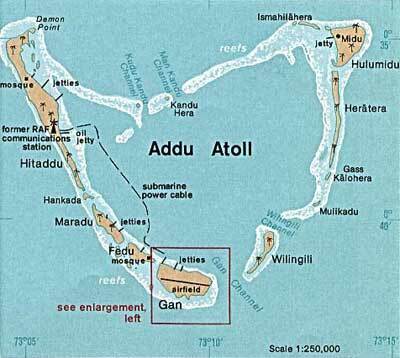 Addu Atoll has since become a major tourist destination, but British personnel assigned there in 1942 despised the post. Morale appears to have been very low among the garrison, and ships’ crews considered it a hardship post. Forty miles north of the equator, the islands are very hot and extremely humid. Gan had no recreational facilities, and the local women were strictly off-limits. The Japanese were not aware of the base’s existence during the April 1942 carrier raids in the Indian Ocean, and Somerville’s fleet used it extensively. Later in the war submarine reconnaissance established the base’s existence, but by this point the Imperial Navy had no designs for a large-scale offensive in the Indian Ocean. The German submarine U-183 did torpedo the tanker British Loyalty in March 1944, making an impressive long-range shot from outside the atoll through a gap in the anti-torpedo nets. In our game Eastern Fleet, we gave Addu Atoll no special secret abilities: The Japanese player knows the British have a base there. The game system doesn’t lend itself to “secret” bases, since the opposing player is going to figure out that a task force probably isn’t going to halt in mid-ocean for several turns. Optional rules make it harder to detect, but unlike Chuichi Nagumo the Axis player already knows it’s there and therefore knows to look for it. 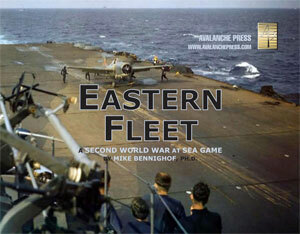 Learn the secrets of Addu Atoll yourself: Order Eastern Fleet today!